Teenagers from the Youth Group at St. Mary Magdalene Catholic Church of Apex, accompanied by adults, spent their Saturday morning on Feb. 1 at the tailrace of B. Everett Jordan Dam. The work of this energetic band of 30 represents environmental stewardship in action. They had the tedious task of removing fishing line carelessly left behind by fishermen on the banks of the tailrace, that fast moving water on the back side of the dam. Fishing line is well hidden between rocks and among bushes. In addition, the group picked up bottles, cans, plastic bags, broken fishing rods, lures and blue plastic bait containers left by fishermen. This is the second group that Clean Jordan Lake has been fortunate enough to recruit for work at the tailrace. Last November, the Alpha Phi Omega service fraternity at UNC-CH turned out 12 volunteers. It was apparent that far more work would be needed. Removal of fishing line is made even more difficult by having to scour the steep rock revetment. 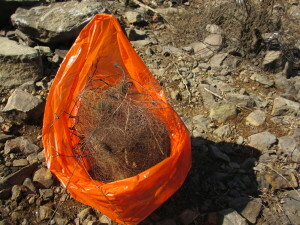 The Youth Group removed 17 bags of trash. The Army Corps of Engineers was on hand to collect the bags and offer safety support. Fishing line is a constant threat to bird life at Jordan Lake. 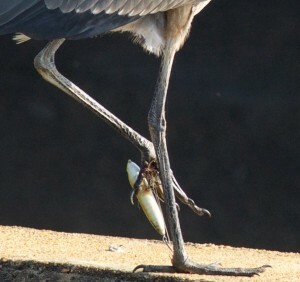 In the photo below, the legs of a Great Blue Heron have not only become entangled by fishing line but also by a giant lure. The Army Corps of Engineer has installed a fishing line recycle box at the tailrace but sadly, it is rarely used. Discussions are underway to find ways to make the program more effective and to educate fishermen about why fishing line is a danger to wildlife.